This vanity has both an all-around look and a traditional style. With a beige tan marble counter and white solid wood base, this product is good-looking and useful. There's plenty of space for items in this vanity's drawers and double-door cabinet. This set from Wyndham Collection is great for anyone looking for great style and function in their bathroom. Enjoy the popular traditional look in your bathroom with this beautiful vanity. The good-looking beige tan marble counter and white solid wood base make a big difference in your bathroom. The simple look of the double-door cabinet and drawers is useful and classic. This simple vanity set from Wyndham Collection will fit right into any bathroom decor. For some added traditional style in your bathroom, choose this beautiful vanity. With a white marble counter and white solid wood base, this piece is very stylish. Made with a roomy double-door cabinet and drawers, this vanity has lots of room to keep items like toothpaste, towels, and hair brushes. Add a classic feel to your bathroom with this simple vanity set from Wyndham Collection. Casotto 23.70-inch W 1-Drawer 2-Door Freestanding Vanity in White With Ceramic Top in White Use this vanity to bring more traditional style into your bathroom. Its beautiful white ceramic counter and white particle board base bring a great new look into your bathroom. Its drawer and roomy double-door cabinet are great to keep bathroom items in. Add a classic feel to your bathroom with this simple vanity set from Home Decorators Collection. 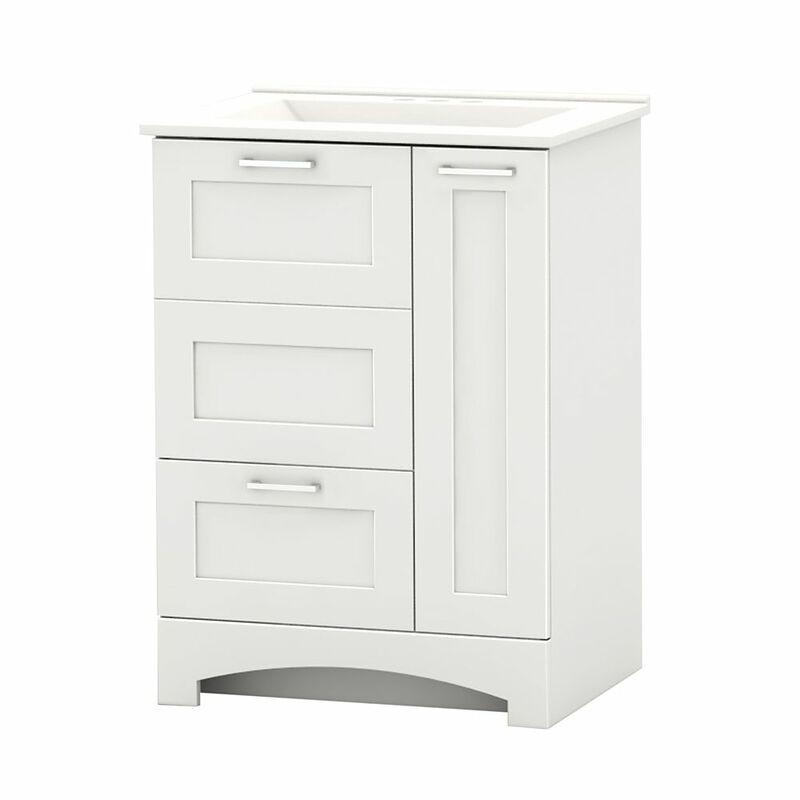 Casotto 23.70-inch W 1-Drawer 2-Door Freestanding Vanity in White With Ceramic Top in White is rated 4.5 out of 5 by 2. Rated 4 out of 5 by Jeanne from Good product - horrible delivery I bought this vanity on December 4. After 3 weeks, it still wasn’t delivered and they didn’t know where it was. I finally had to get a refund and re-order the vanity. The second order came in after a couple of weeks which was good. It had a tiny crack at the back foot base but at this point I needed the vanity so I just kept it. I was never offered a discount for my troubles. When I asked I was told to call back after I got the second one and ask for a discount. The first one I ordered arrived out of the blue and was left outside in the snow 6 weeks after it was ordered. I contacted Home Depot to have them come pick it up and asked that they call first because the address was a house under renovation and we weren’t always there. The guy just showed up one day unannounced to pick it up just as we were leaving for the day and he said he had never been asked to call first. In fact he laughed and said he found it funny when people said that be cause they never called first. Just wondering if there is a picture of the doors opened. Looks like 2 drawers and 1 door to me??? The newly added image in the gallery shows the doors and drawers open. Hope this helps!